For the first time at the ESASO Retina Academy we will have a Live Surgery Session! Thursday, 22 October from 15:00 to 17:00 at the Palau de Congressos de Catalunya. Only registered participants may attend! • They will vote to select their preferred one. • This question will be discussed on the round table. The Scientific Committee, chaired by Francesco Bandello, has developed an engaging scientific programme. Internationally renowned retinal specialists from all continents will present most up-to-date guidelines on the treatment of dry and wet AMD, macular edema and retinal non perfusion due to diabetic retinopathy or venous occlusion, macular pathology of vitreous adhesion and macular holes, vitreo-retinal surgery, and the use of new techniques and equipment. Retinal detachment, VMA/VMT/MH, AMD, DME, RVO, PM, Retinal non-perfusion, Geographic Atrophy, Central Serous Chorioretinopathy, Uveitis, Tumours, Dystrophy, Rehabilitation, Artificial Vision, and other topics of Retina and General Topics. The 15th ESASO Retina Academy 2015 has been accredited with 11 ECMEC Credits by the European Accreditation Council for Continuing Medical Education (EACCME). CME accreditation granted by the UEMS-EACCME® provides a guarantee to participants from all over the world that the content of the CME provided is of a high quality, unbiased and didactic and, for European doctors, that this quality will be recognised in their home country. The EACCME is an institution of the European Union of Medical Specialists (UEMS),www.uems.net. Each medical specialist should claim only those hours of credit that he/she actually spent in the educational activity. The Palau de Congressos de Catalunya is located in the prestigious Avenida Diagonal of Barcelona, the most important financial and business centre of the city. The building is a part of the Hotel Rey Juan Carlos I – Business and City Resort and is surrounded by some of the most breathtaking gardens in Barcelona. The entire hotel complex is one of the most outstanding urban settings in the world. The building itself is a symbol of contemporary Barcelona. It was designed by the architects Ferrater and Cartañá and has received the National Architecture Prize in 2001. The complex is made up of several adjoining buildings, which together provide great functionality and versatility, where natural light is the principal feature. The Palau de Congressos de Catalunya has 35 halls and rooms of varying sizes. The grandiose Auditorium can hold a maximum of over 2,000 people. The maximum exhibition space is over 4,000 sqm. Badges for delegates Delegates will receive individual name badges when checking in for the congress. According to the ESASO guidelines, name badges must be worn at all times throughout the congress. Congress Language and Translators The official congress language is English. Please take note that simultaneous translation may be provided at the request of respective countries, but will otherwise not be provided. Food and Refreshments Food and refreshments are not included in the registration fee outside congress times, with the exception of the planned congress hospitality. Insurance(s) The Organisers are not responsible for individual medical, travel or personal insurances. Delegates are advised to make their own personal insurance arrangements. Registration Desk – Schedule Badges and congress documentation will no longer be given out at the congress hotels but only at the congress center. Programme: Cocktails followed by a three course dinner. 19:30 shuttle from the congress Hotels. Return shuttle to the hotels will be provided. 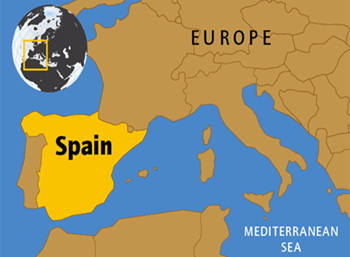 Spain is a country located in south-western Europe, bordered by France to the north-east, Portugal to the west, and the small British Overseas Territory of Gibraltar towards the southern tip. Its area is just over 505,000 square kilometers, positioning it as 52nd largest country in the world, and second in the European Union, to which Spain belongs. The country’s government system is a parliamentary constitutional monarchy, with a democratic approach to leadership. The Spanish capital city is Madrid, located in the exact center of the country. The territory of Spain is comprised of its mainland (around a fifth of the Iberian Peninsula), the Balearic Islands archipelago, located in the Mediterranean Sea off the mainland’s east coast; the Canary Islands archipelago, located in the Atlantic Ocean off the coast of southern Morocco; and the seaside enclaves of Ceuta and Melilla, located in northern Morocco. The country has a population of about 49 million, concentrated mainly in the cities of Madrid, Barcelona, Valencia, and Seville. The coastal regions of Malaga, Alicante Valencia and Catalonia also have a higher density of population per square kilometer. Politically Spain is divided into autonomous communities, which are further divided into provinces, then smaller areas known as comarcas and finally municipalities, which are the individual villages, towns and cities. In total, there are 17 communities plus Ceuta and Melilla, and 50 provinces. The cradle of Catalan culture, amongst many other cultures and civilizations, and a witness to major transformations such as the Industrial Revolution or the Civil War amongst many others, Barcelona has a fascinating history. The first human settlements in Barcelona date back to Neolithic times. The city itself was founded by the Romans who set up a colony called Barcino at the end of the 1st century BC. For over 200 years, Barcelona was under Muslim rule and, following the Christian reconquest, it became a county of the Carolingian Empire and one of the main residences of the court of the Crown of Aragon. The fruitful medieval period established Barcelona’s position as the economic and political hub of the Western Mediterranean. The city’s Gothic Quarter bears witness to the splendour enjoyed by the city from the 13th to the 15th centuries. A period of cultural recovery began in the mid-19th century with the arrival of the textile industry. During this period, which was known as the Renaixença, Catalan regained prominence as a literary language. The 20th century ushered in widespread urban renewal throughout Barcelona city, culminating in its landmark Example district, which showcases some of Barcelona’s most distinctive Catalan art-nouveau, or modernista, buildings. The Catalan Antoni Gaudí, one of the most eminent architects, designed buildings such as the Casa Milà (known as La Pedrera, the Catalan for stone quarry), the Casa Batlló and the Sagrada Família church, which have become world-famous landmarks. The freedoms achieved during this period were severely restricted during the Civil War in 1936 and the subsequent dictatorship. With the reinstatement of democracy in 1978, Barcelona society regained its economic strength and the Catalan language was restored. The city’s hosting of the 1992 Olympic Games gave fresh impetus to Barcelona’s potential and reaffirmed its status as a major metropolis. In 2004, the Forum of Cultures reclaimed industrial zones to convert them into residential districts. An example of the renewed vigour with which Barcelona is looking towards the 21st century. Many restaurants, especially those in the city centre, have menus in several languages. Electricity supply is 220 volts throughout Spain, with 2 pin wall sockets. For any European countries that use 240 volts, for e.g., UK and Ireland, most electrical equipment will function adequately. The time zone in Spain is CET (Central European time) which is GMT + 1 hour. Barcelona uses the Euro as its currency. Tipping is not a requirement, however, a 5% to 10% tip would be considered polite. Visitors may withdraw money in Euro with their debit cards from the ATMs. Use a regular bank (La Caixa, Catalunya Caixa, Caixa Penedes, BBVA …) rather than exchange kiosks as the exchange ratio is more favourable in a regular bank. Moreover, financial institutions post their exchange rates outside so you will be able to compare their ratio to the ratios applied by the exchange kiosks. Credit cards, including AMEX, are widely accepted in most restaurants and hotels. However many smaller restaurants and hostals still do not have credit card payment facilities. Barcelona has a typical Mediterranean climate. The weather in October and November is still pleasant but starting to get a little cooler (21°C down to 15°C, 69 to 59F). You won’t find sunshine every day though, so be prepared for days when it could be overcast with a little rain. Cell phones work within the whole city zone without any problems. You can also make phone calls with a cell phone in most of the metro stations and trains. There are several mobile cell phone companies available in Spain, like Vodafone, Telefonica, Orange and Yoigo. Spanish phone numbers always have nine digits and don’t have a dialling code. A leading 0 no longer exists. What used to be the dialling code for Barcelona (93) is now part of every phone number and always has to be dialled. Smoking is prohibited in public buildings and public transport. Barcelona Airport is located south-west of the city of Barcelona. The Barcelona Airport is located at 12 Km (20/30 minutes) from the city and connected to by train and bus. Land communications are basically designed on the network of motorways, which radiate towards the most important economic areas of the rest of Spain and connect with the French motorway system to the rest of Europe. 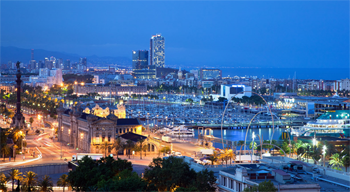 Barcelona has become the Mediterranean’s foremost cruise ship harbour. It has eight passenger terminals, five for cruise liners and three for ferries. It operates services to the Balearic Islands and the main Mediterranean ports. Ferries depart daily for the Balearic Islands and there is a direct service to the port of Genoa. Barcelona harbour has direct connections and operates regular passenger and vehicle transport services to the Balearic Islands, Genoa, Rome and Algiers-Oran. Barcelona is one of the main cruise harbours in the Mediterranean and is establishing its position as the base port for cruise companies. Actually is the 1st European cruise and the 10th World one. Taxis are plentiful in Barcelona. There is a constant stream of them allocated by a Marshall at the Airport and they can be found in ranks all over the city. There’s only ONE kind of licensed taxis in Barcelona, and despite to which company they might work for, they are all painted black and yellow, and look like this. All are metered, but there is a range of extra fees / supplements that can be added. If you are coming to Spain from another country in Europe, a passport or visa will never be required for entry into the country. If you are coming from a non-European country, however, you will need a passport, which must be valid for a period of 90 days after the length of the planned stay in Spain. Alternatively, contact your embassy for more information. Letters of invitation required to meet the administrative and legal regulations for visas of some countries are available to participants upon written requests. Please inform the congress secretariat for further processing. The 15th ESASO Retina Academy 2015 adheres to current industry compliance guidelines and follows transparency and integrity policies. The organisation interacts with the industry on an ethical, appropriate and professional level at all times. Educational events, sponsored and supported by industry, are intended to foster advancement in the management of diagnosis, treatment and therapy of healthcare professionals to enhance their interactions with their patients.